Kevin Martin, lead singer of the band Candlebox, returns with a new album titled, “Into the Sun.” Since its release, the band has been on a full onslaught of dates around the country. Martin recently took a break from the tour to talk. 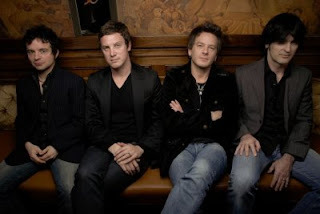 Q – Candlebox was founded in 1991. How has the band changed since you started? Q - What drives the band’s music? A - Everything really - life, love, politics, race, religion, night, day etc. As a lyricist I try to write what I see, feel, touch and so on, and as musicians we try to express those same feelings/desires/wants through the melodies/songs that we are writing. Q - What do you want audiences to take with them when they leave a Candlebox show? A - Hopefully a t-shirt. Seriously though I would hope that they take a little bit of us with them, our passion you know. Maybe a better understanding of themselves, something they found in one of our songs that fits. We put on a hell of a show and are exhausted at the end of it; I hope they loved it as much as we did. Q - Candlebox has had some changes in its lineup over the years. How do you keep the chemistry together? Has it been hard to do that and make music? A - The chemistry has always been the music that we create. I’ve often said at times that we, Candlebox, would make a great psychological study. For that matter so would any rock and roll band. It’s just so personal you know. I think the thing that has kept our chemistry working for us is the fact that Pete (Klett) and I have always been the main writers for the band and still are. It has been difficult at times, we have butted heads on several occasions but somehow we’ve always been able to put those differences aside and focus on what is best for Candlebox, not what is best for Kevin or Pete or Scott (Mercado). Q - People remember Candlebox’s hit song “Far Behind,” and some probably think the band was a one hit wonder. What would you like to say to these naysayers? A - I always laugh at that “one hit wonders” saying. To be quite honest, I never really thought we had a hit so I have to laugh. To me a hit song is a song that cracks the Billboard Top 10. On the US Hot 100 chart, the highest we ever got with “Far Behind,” was #18 so I would say to the naysayer’s, we aren’t a one hit wonder, we’re a no hit wonder. Honestly it doesn’t really matter to me how you remember Candlebox, whether it’s “Far Behind” or “Simple Lessons” or “It’s Alright,” just as long as you remember. Q - Does the road ever get to you? A - Yes, it can be extremely exhausting and challenging. Not enough sleep leads to a strained voice which leads to stress and then the inevitable, a bad show! Q - What do you like to do while on the road? A - I don’t know, I’m always working. Kidding, sleep is my favorite thing to do and then there’s always a bar when you need one. Q - What does each member bring to the band? A - Stress, and perhaps a laugh or two. Q - How does the band comprise music together? A - Generally a song will start from an idea that Pete or myself are working on. We’ll bring that to rehearsal and see if we, collectively, can develop the idea. There have been several occasions where one of us will come in with a finished song and we just need everyone else to put their special little touch on it.